Comments: Hi crowfootnc just getting a chance to see this. Yes, your correct it's that Ritchie Blackmore, Smoke on The Water. Comments: Is this Ritchie Blackmore formerly the Awesome Guitarist for Rainbow...Smoke on the Water! Comments: Very good CD. They had some videos on youtube but they are all gone now. Village Lantern is my favorite track. Fires at Midnight is running neck and neck with this one as my favorite. Comments: My daughter gave me this cd a while back, but, I must say I have yet to listen to it fully. I will now cetainly get it out and give it the attention due such a high recommendation as is given here. 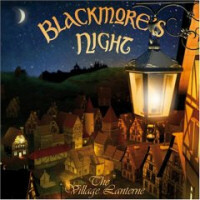 Comments: I would like to say The Village Lanterne by Blackmore's Night is just amazing. I love the Street Of Dreams. I would like to say Welcome to this wonderful place called Celtic Radio it's a honor to have you here. Write about The Village Lanterne! Want to write a review about Blackmore's Night's The Village Lanterne album? Post your comments in this box to be displayed in our community forums and in our album database! Please make sure you are logged in before proceeding. Please login to write your comments about The Village Lanterne.